An opinion shared by Theresa May, the UK’s Prime Minister, has caused quite a stir among animal rights activists. During a recent visit to a factory in Leeds, May commented that she supported hunting with dogs, which was outlawed in 2004 under the last Labour government. Additionally, she said that she desires to bring back the “sport” of fox hunting. “This is a situation on which individuals will have one view or the other, either pro or against,” stated the Prime Minister. 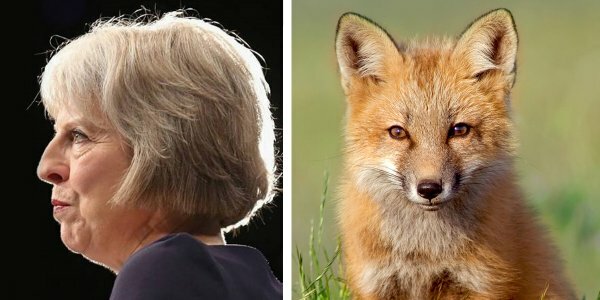 “As it happens, personally I have always been in favour of fox hunting, and we maintain our commitment, we have had a commitment previously as a Conservative Party, to allow a free vote. “It would allow Parliament the opportunity to take the decision on this,” she added. The Independent reports that Chairman of the Council of Hunting Associations, Tory Lord Mancroft, is confident that the Prime Minister has enough support for “a new era for fox hunting” to be realized. He also added that a vote could be scheduled as soon as this year. Despite the optimistic outlook of both politicians and hunters, the reality is that 84% of the public still believes the blood sport should remain illegal. Campaigners have countered this claim by stating that illegal fox hunting continues to take place regardless. Sir Roger Gale, who is seeking re-election in North Thanet, disclosed that he would oppose any and all attempts to repeal the Hunting Act, should a free vote take place in the next parliament. He also said that MP’s in the next parliament will have “more than enough to occupy” their time without considering the argument of yesterday concerning repealing the Hunting Act, therefore, should probably drop the argument. Before silencing his thoughts, he added that he “cannot see many Conservative votes” for fox hunting in marginal seats the party is targeting at the General Election.
? Awesome Underclothes Display The 4th Amendment When X-Rayed By TSA 100 Percent Renewable Energy By 2050: Senators Introduce ‘Most Ambitious’ Climate Plan Ever ?